The Spoon-billed Sandpiper (Calidris pygmaea) is a small wader which breeds in north-eastern Russia and winters in Southeast Asia. 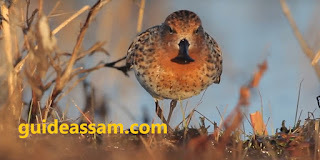 Spoon-Billed Sandpiper, one of the world's highly threatened birds breeds in the Chukotsk and Kamchatka peninsula, north-eastern Russia, winters in Bangladesh and Myanmar. Some wintering birds have also been seen in India and Vietnam, China, Sri Lanka, Thailand, Singapore, and Malaysia. It has been twice recorded from Assam. It is severely affected by habitat loss, hunting, and climate change. Looks - A small sandpiper with a one-of-a-kind black spatulate bill. 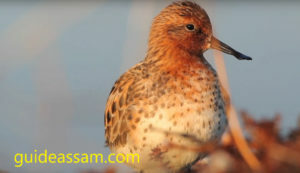 Spoon-billed Sandpipers measurements are; wing 98–106 mm, bill 19–24 mm, bill tip breadth 10–12 mm, tarsus 19–22 mm and tail 37–39 mm. 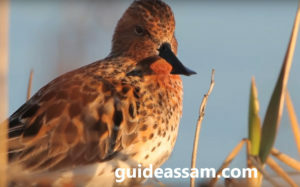 During the breeding season, the bird is rich reddish brown, particularly around the head, breast, and back. The breast has varying amounts of dark spotting extending toward the belly, which is white. During the nonbreeding season, Spoon-billed Sandpipers are a mixture of white, black, and gray. The upperparts are mostly gray with a lightly streaked cap and back of the neck. Its underparts, throat, and forehead are white often with a white streak over the eye. Legs are black. Spoon-billed Sandpipers feed on a variety of larval and adult invertebrates, especially midges, mosquitoes, flies, beetles, and spiders. They also feed on some plant material including grass seeds and berries. On the wintering grounds and during migration they feed on a variety of marine invertebrates including polychaete worms and shrimp. 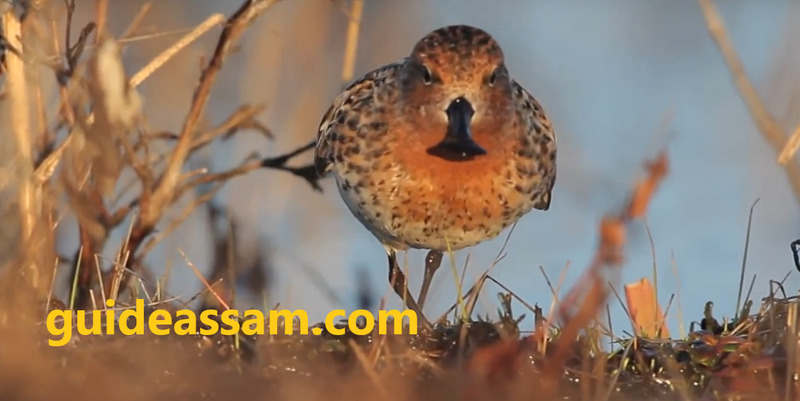 The contact calls of the spoon-billed sandpiper include a quiet preep or a shrill wheer. The song, given during display, is an intermittent buzzing and descending trill preer-prr-prr. The display flight of the male includes brief hovers, circling and rapid diving while singing.